Most mornings in the Marais Poitevin, we awoke to a regular but fascinatingly varied dawn chorus started, as at home, by a Robin proclaiming his territory. He was quickly joined by a Song Thrush and a Blackbird before various other songsters, including a Wren, Chaffinch, Nightingale and Golden Oriole, joined in, each proclaiming their own territorial slice of the marais. What an avian joy it was. At our relatively overcrowded campsite overlooking Rocamadour, our dawn chorus consisted of a Pigeon cooing, followed swiftly by the territorial call of Homo sapiens subspecies tourista muttering, “what the f***’s happened to the electricity?” Both ourselves and our neighbour seemed to have lost power overnight. Our neighbour said (in French) that the electricity supply had been fine until about 7:00 AM when they started making coffee and grilling les tartines. Hmmm, suspicious! I went to see madame who flicked a circuit breaker and our supply was restored. Not so our neighbour, whose van remained obstinately dead. They were convinced it was a campsite problem, madame was convinced it was their problem. She switched them to another supply and they remained dead. I tried their electricity port and it worked. The problem was in their van. “Someone” had attempted to draw to much current and popped the circuit breakers. They eventually found a breaker popped in their van also. Case proven! Most camping electricity supplies en Angleterre are 16 amp – quite sufficient. En France, 6 amps is probably most common where great care is needed. There are a few archaic sites with a particularly desperate 4 amp supply which is next to useless (fridge and lights only). Some sites, this included, supply 10 amps which rates as fairly luxurious but still requires care. A domestic electric kettle draws 10 amps; one has to choose one’s camping appliances carefully and certainly one has to be wary about using which of them one uses in combination. We’ll see what happens tomorrow morning. 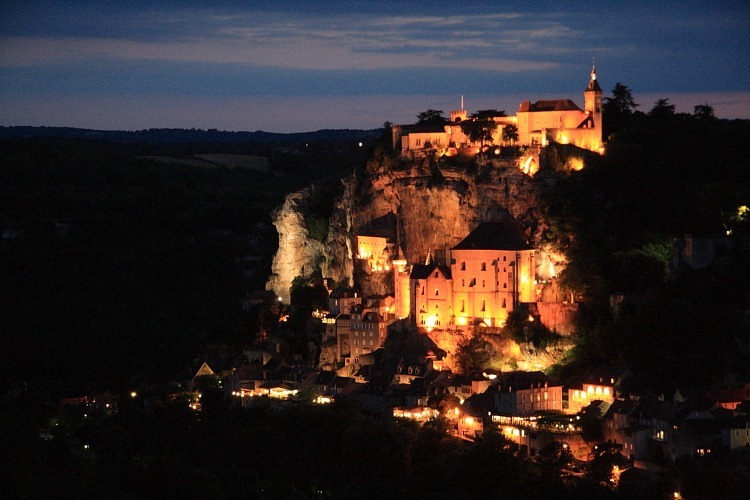 Just to complete the picture, here is something approaching the other traditional tourist shot: Rocamadour at night. A weather report tomorrow will probably decide whether we stay among all these yapping dogs and rugrats, or whether we try to move on to similarly crowded but hopefully calmer places. Expectations are that we’ll not be able to avoid it until Monday next week. We used to do this voluntarily in late July/August when everywhere was crowded. I have no idea how.